Marsilea minuta is a highly plastic and variable pteridophyte. Other species, namely, M. brachycarpa, M. brachypus, M. gracilenta and M. maheshwari also fall within the range of variation and probably are different environmentally induced phenotypes (Cook). All Marsilea species are found in Africa and in India highlighting the fact that India was once upon a time connected to Madagascar. Please note that the above slideshow is automatically created by searching Flickr and does not contain manually curated images. Hence, it is likely that some images may not be exactly of Marsilea minuta. The plant is highly variable. It appears cushion-like on dry lans, but in water is spreading and creeping. Internodes 0.5-20cm long. Petioles 2-8cm long on land and upto 25 cm or more in water. Leaflets a maximum of 2.5 cm. Sporocarp stalks simple, numerous, arising one above the other near base of leaf stalk. These sporocarps are usually crowded and in groups of 2-3. 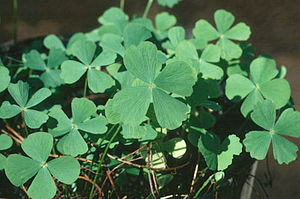 All Marsilea species possess creeping or floating stems/ The leaves are spirally rolled when young. The petioles terminate in four leaflets. The margin of leaves is entire when growing in water, but when they encounter dry climate, the margins become crenate or toothed. Sporangia are in closed sporocarps, borne on short stalks on the petioles.."The plant is highly variable. It appears cushion-like on dry lans, but in water is spreading and creeping. Internodes 0.5-20cm long. Petioles 2-8cm long on land and upto 25 cm or more in water. Leaflets a maximum of 2.5 cm. Sporocarp stalks simple, numerous, arising one above the other near base of leaf stalk. These sporocarps are usually crowded and in groups of 2-3. All Marsilea species possess creeping or floating stems/ The leaves are spirally rolled when young. The petioles terminate in four leaflets. The margin of leaves is entire when growing in water, but when they encounter dry climate, the margins become crenate or toothed. Sporangia are in closed sporocarps, borne on short stalks on the petioles.." cannot be used as a page name in this wiki. It is a tenagophyte. Juvenile usually submerged, adult is terrestrial. The plant is perennial, but sometimes annual. In different Marsilea species, the adult can be floating, emergent or terrestrial. Plants usually require an emergent period to develop sporocarps. The sporocarps may remain viable for over a hundred years and may get reactivated after passing through a duck. 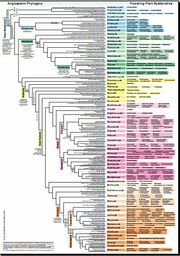 There are no fruits and flowers in Pteridophytes. But, the sporophyte of this plant is used by the natives of Andaman Islands as food. This page was last modified on 6 September 2010, at 07:37.